1. The night before, rinse your beans under running water, place in a large bowl and add double the quantity of cold water. Soak them overnight. 2. Preheat oven to 90°C. 3. In a large heavy-bottomed casserole dish, warm up the olive oil, add the butter and sear your meat until it’s a dark golden colour all over. Keep turning the meat over, and make sure the pan is hot enough. Add in onion, carrots and garlic, sweat for a few minutes, add the bouquet garni, thyme and rosemary, cover with lid and place in the oven at 90 degrees. Cook for seven hours. 4. Drain and rinse the beans, place in a large casserole dish, add the chicken stock and bring to the boil. Skim the white foam off with a small ladle, then when the bouillon is clear, add the carrot, onion, peeled garlic and bouquet garni. Boil for two minutes and simmer for about an hour on a slow heat. Taste your beans as they cook, and season halfway through with salt. Make sure they are slightly undercooked as they will carry on cooking when reheating for serving. Put them aside until needed. 5. Turn your mutton over now and then, and place a small knife through the meat – it should enter the heart of the meat with no resistance. Leave it to rest for a while. 6. Place the meat on a tray and cover it with a sheet of foil. Pass the jus from the meat through a sieve into a small saucepan and reduce by half. Season to taste. 7. To serve, bring your beans to temperature, take out the bouquet garni and the onion and discard them, add a good knob of butter, stirring gently, then at that stage season with ground black pepper and salt if needed. 8. Place your meat on a serving plate, put the beans on the bottom, pour the sauce over and serve up. You can carve the mutton before, you sit down or at the table. As always, at the start of each year magazines, newspapers and blogs devote a large amount of space to the hot new culinary trends for the coming year. What will be this year's quinoa? Is kale still fashionable? Are amaranth smoothies the new charred leek? It makes me smile. Predicting annual food trends may make for a quick, amusing read but these fads and fashions have little to do with good food. We don't pay much attention to trends in the Escargot kitchens. 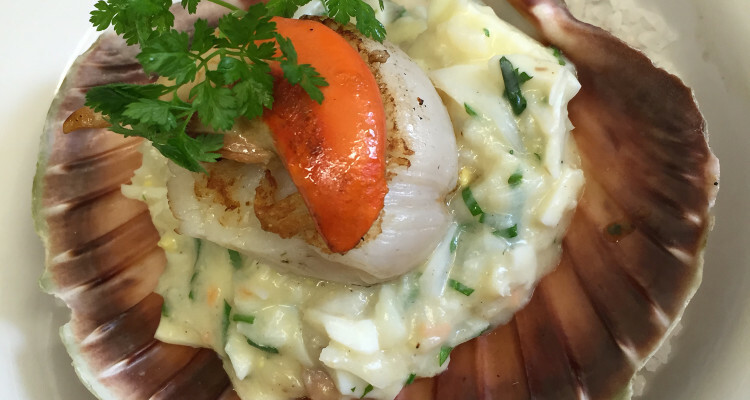 My cooking is founded on classic French dishes made with the best Scottish produce that I can find. Our dishes are based on tried and tested culinary traditions. From Boeuf Bourguignon to Coq au Vin; I like to cook dishes that have pedigree and their own heritage. That doesn't mean that these recipes are set in stone. Things move on and change can be good. After all, twists and tweaks can evolve a dish. For example, I might make Coq au Vin using local beer rather than wine, or use venison and beef cheeks to make Boeuf Bourguignon. The point is that those changes are made within the framework of the recipe's heritage. I don't try to reinvent the dish. If I tweak a dish then I do it with respect, I don't do it simply for the sake of novelty or to incorporate an ingredient that has been hailed as the new flavour of the month. Good cooking is not about following trends. However, some of the fundamental truths of good cooking have become fashionable. Seasonality and sustainability have become buzzwords over the last few years. This is good news. I'm delighted that they have moved up the restaurant agenda. However, I do wonder if this zeal for seasonality and sustainability will last or be cast aside when a new trend emerges. Seasonality is not a box you tick simply because you want to be seen as being on trend. It is one of the founding principles of cooking and eating well. Good kitchens have always worked with the seasons. In the days before we had refrigeration and before we imported produce from far away countries, chefs cooked seasonal ingredients because that is what was to hand. It made good sense then and it is the best option now - even if we do have the opportunity to eat Kenyan asparagus in January. When you eat seasonally, you eat ingredients when they are at their best. When they reach their peak, they are also at their most abundant and that means they will be at their best price. Eating seasonally is eating economically and that applies to both restaurant and domestic kitchens. Perhaps more importantly, there is a simple yet great pleasure to be had in anticipating the first strawberry or chanterelle of the season. That pleasure is lost if these ingredients are available all year round. We become blasé about them. Sustainability has become another marketing point for restaurants, and rightly so! Sustainability is important but it is not a 21st century invention. One aspect of sustainability in restaurants is extracting the maximum from all the products used in the kitchen. Everyone has heard about nose to tail eating. This year, root to stem eating is being hawked as a hot new trend and we are all being encouraged to eat the parts of plants that are normally discarded. This is a very sensible idea, which we should encourage, but it is not a dazzling new revelation. In the early 80’s, I was in my early teens doing an apprenticeship at a restaurant in Saint-Maure-de-Touraine. The chef patron of the restaurant bar was an old school chef. This had advantages, but let's just say that he would have been baffled by contemporary concepts such as dignity at work. For all of his character defects, he knew how to extract every last drop of flavour - and value - from his ingredients. The waste bin in that kitchen was seldom well fed. Potato peelings body-swerved the bin and they never reached the compost heap. Instead, they were deep-fried, salted and sold as very more-ish bar snacks to grateful drinkers. In many kitchens, those peelings would have been binned. The old school chef was savvy enough to use everything he could and was canny at turning potential discards into desirable dishes. He would have raised an eyebrow at the idea of food trends. Food fashions were about as important to him as Parisian catwalk fashions. He would have been stumped by questions about his sustainability practices and amused at the idea that restaurants would pay big money for imported, out of season ingredients. And yet he practised seasonal cooking, operated a finely tuned waste reduction system and sourced all of his ingredients from local farms or his own garden. And not because it was on trend. He did it because it made sound sense and was integral to cooking well. This was true thirty years ago. It was true three hundred years ago and it remains true now. Food fashions come and go. By contrast, the basic principles of good cooking may swing in and out of fashion but they have lasting value. Much like my old chef, I know nothing of haute couture but Yves Saint Laurent hit the nail on the head when he said that 'Fashion fades. Style is eternal'. Unlikely as it may seem, there are some happy similarities between the ateliers of the fashion houses and well-run kitchens. Knowing where our ingredients come from is at the heart of what we do in L'escargot restaurants. Of course, most restaurants would make the same claim. However, just seeing the provenance label on a piece of lamb, pork or cod is not enough for me. I like to meet the people who catch, raise, grow and harvest the food that we cook in our kitchens. Which is why, after another anxious flight, I recently found myself on Orkney. 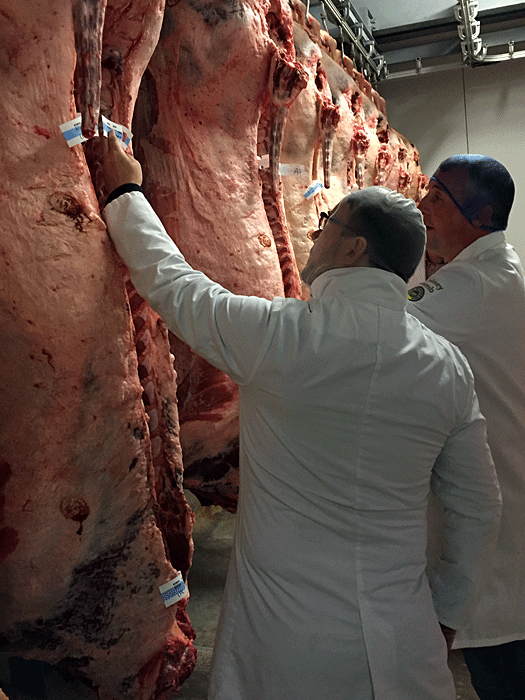 I was there to meet local butcher Ali Flett and visit the farms which produce the local beef. You can tell a lot about the way cattle are raised by how they react to a visit. If they panic and run to the other side of the shed that tells you something about how they are treated. By contrast, the cattle I saw on Orkney were inquisitive and would come to us. They were content. Ali is part of a consortium which is trying to ensure that Orkney beef retains its Protected Designation of Origin (PDO) status. You can get the full information on what this means here. In brief, Orkney beef's PDO status is important because it sets out and protects the regional characteristics which make it unique. It is a combination of the local feed, breed and traditional husbandry techniques which make Orkney beef 'distinctly different in terms of flavour and palatability' from that produced elsewhere in the United Kingdom. Surprisingly, the sun was shining during my two days on Orkney but more the usual high rainfall is just one of the Orkney factors that produces the lush grass which the cattle graze on. In other words, it is a taste of the land that produced it. If you are disappointed by generic 'Scotch beef' - an almost meaningless label - Orkney beef (PDO) is a premium, sustainable alternative which is rooted in, and the unique product of, a clearly defined geographic area. To qualify for PDO status, Orkney beef must be born, reared and slaughtered in Orkney. The criteria are strictly defined and it can take years to verify those criteria and be awarded PDO status. And this is where things get difficult. Orkney has a state of the art abattoir which can process 200 head of cattle a day. It is currently doing around 20 a week. Many Orkney farmers are paid a subsidy to have their cattle slaughtered on the mainland. Beef which is produced in this way loses its PDO status but can still be called Orkney beef. Most consumers do not differentiate between the two and this erodes and chips away at the prestige of PDO status Orkney beef. If consumers don't ask for PDO Orkney beef, demand will fall, Orkney's abattoir will close and the PDO status will be lost for years, perhaps permanently. We use Orkney beef (PDO) in L'escargot restaurants because it is an excellent, high quality product with a unique texture and flavour. Having seen the cattle in their byres, I also know that they are raised to the highest standards of animal husbandry. Just as important is that by using Orkney beef with PDO status we, and our customers, are helping to preserve a unique regional tradition. We are keeping alive and celebrating a way of producing beef which can only be found on Orkney. We think that is worth doing. We are happy to be corrected but we also think that we are the only restaurant in Edinburgh, perhaps the Central Belt, which is selling Orkney beef (PDO). As a restaurateur, it is always good to be doing something different from other restaurants but, in this case, we would be absolutely delighted if other chefs followed suit and supported Orkney beef (PDO). My introduction to Barra and its snails came via an unexpected email containing a photo. The picture showed a fat cluster of snails on a fence post against a background of blue skies and a wind-swept beach. I knew they were petit gris, one of the two types of snails we eat in France. I also knew what to do with them when a sample batch of Barra snails arrived in my kitchen. Slightly salty with faint traces of iodine, they tasted of the land that produced of them and they are fantastic in a beef Bourguignon; delicious in a Gorgie Farm pork terrine and sensational when cooked en papilotte with garlic and butter. Although I didn't know him at the time, the person who sent the email was Gerard MacDonald, owner of The Isle of Barra Oyster Company. When not tending his oysters, Gerard had been wondering if there was a commercial use for the abundance of wild petit gris snails which flourished on the calcium-rich machair of Barra. Which is why, earlier this year, I found myself sitting in a 12 seater, twin prop plane flying over the west coast of Scotland to the Outer Hebrides. I'm a poor flyer at the best of times and the small aeroplane was doing nothing to calm my nerves. However, as the flight progressed, I gradually unclenched my fists, opened my eyes and peeked out of the window. What struck me most was that we were flying over tiny islands which appeared to have one small farm on them and nothing else. It is this remoteness which contributes to the quality of Barra's snails. As Gerard explained to me, after the plane had landed on the beach , the use of pesticides is banned on the island and the naturally growing snails are as clean, pure and toxin-free as can be. We found them huddled under stones, sitting in grass, massed on fence posts and even hiding in fence posts. They were everywhere. This was Scotland's natural larder just waiting to be harvested. My restaurants are French restaurants but I am passionate about using the best Scottish produce. Picking them from the machair is as close as you can get to first hand sourcing. Why would I buy farmed snails from France or Indonesia (where most of them come from) when I can source them direct from Scottish islands? Buying from Barra supports the island's economy and my restaurant customers love the idea of eating Scottish snails. It's a talking point. Similar thoughts struck me the next day when we visited Barra Atlantic, a Barra fish and shellfish processing company. They had bags of beautiful cockles, winkles, razor clams or spoots and langoustines. Many of them already had French labels and were prepped for export directly from the island. Lucky French. And Spanish and Portuguese. I would love to be able to use these cockles and winkles in my restaurants and yet, if I ask my supplier to provide such ingredients, I have to order them a week in advance. And there is no guarantee that I will get them. On Barra, we watched the cockles being raked from the sands of the beach where our plane had landed. It reminded me of my childhood. My family would go on holiday in the Vendée. My gran, my mother and I would collect cockles at low tide and then eat them that evening. Times change and childhood memories don't have much say in international markets. However, it seems wrong that Scottish restaurants must sometimes struggle to source Scottish products. The blame certainly doesn't lie with companies like Barra Atlantic. It is up to us to appreciate and use the natural bounty of our fields, seas, mountains and machair. Eating locally and seasonally is sustainable. It cuts air miles, supports local economies and it tastes great. Moreover, when people eat in a restaurant in Scotland, they want to eat Scottish ingredients. That means Scottish spoots and winkles as well as beef, lamb and salmon. We have the ingredients. Now we need to take real pride in the food produced here; we need to shout about it and develop our domestic market. So, anyone for a Barra snail tartine?